Where do you find the most germs in an airport? Airplane bathrooms top the list. When you’re traveling by air, try to use the bathroom before you get on the plane. Bar none, the germiest place on an airplane is the tiny restroom. 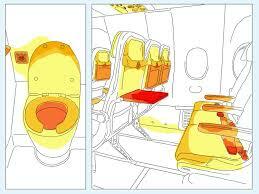 Because they are not cleaned during flights or on continuing flights, germs and bacteria are everywhere. Studies have found E. coli on almost every surface—including the toilet, hand rails, sink area, and door. Be sure to wash hands with soap and water. Use a paper towel to open the door. What other places in the airport accumulate a lot of germs? Any surface will collect germs, especially given the number of people walking through the airport and touching things. Door handles, tables, elevator buttons, hand rails, and other high-touch items are often covered with nasty stuff and may not be hygienically cleaned. Airplane tray tables. With quick flight turnovers, these tray tables aren’t getting sanitized between every trip, either. So think about that before you eat off of one on your next flight. Bring sanitizing wipes and give your tray table a quick once-over before using it. What steps can passengers take to stay clean while going through the airport? The best advice is to do what your mother told you to do—wash your hands thoroughly and often with soap and water. Avoid touching your eyes and nose. Cover your mouth when you cough or sneeze. And carry hand sanitizer for use between hand washings. What can passengers do to stay clean in the airport security line? Wear socks through the security line instead of walking bare foot, which can increase your risk of picking up diseases. Children 12 and under are no longer required to remove their shoes to go through airport security, so that adds one more way to help protect your kids. Are hand-sanitizers effective in protecting passengers against germs? Hand sanitizers are recommended when hand washing with soap and water is not an option. They are a good back-up plan and easy for children to use. Also carry disinfecting wipes if possible. I use them on the tray table as a standard rule. Do airports have more germs than planes? Both airports and airplanes are transfer stations for large numbers or people and for the germs they carry. They both present a vast number of opportunities for harmful germs to find a surface and live there. In any place where there are a lot of people and a lot of surfaces to touch, there will be more germs. That goes the same for your workplace, workout facility, doctor’s office, favorite restaurant, and other common places that most of us visit in our daily lives. Do you get sick when you travel? Chances are you’ve contracted some germs from the air that you have been breathing. You can wear a face mask or even easier wear a “Fresh Air Buddy”. Your own personal purifier that is so small you can wear it around your neck. It keeps germs out of your air space. I recommend putting this on the minute you enter the airport.